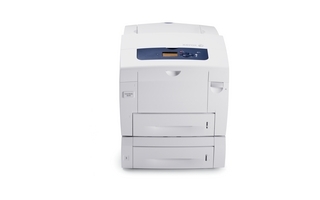 Take your color printing to the next level with the Xerox Phaser 6280 from Pacific Office Automation. This fine piece of office technology integrates seamlessly into your existing network, allowing you to get started with fantastically printed color images, graphics, and text. A simple driver installation process gets your printer connected and ready to go in just a few clicks. This highly rated laser printer is ideal for workplaces that are tired of the additional costs surrounding print outsourcing. Keep the majority of projects—regardless of media type—in-house. The Phaser 6280 features a faster print speed than even many black and white MFPs, delivering the first copy in a mere 10 seconds. This printer’s incredible speed is backed by its impressive 400 MHz processor that moves information and files quickly through your printing system so there’s no lag time. As you print color images, you can enjoy an amazing 600 x 600 dots per inch resolution and endless customization settings. PANTONE Color-approved solid color simulations deliver the colors you expect before you print, while advanced color correction technology includes the ability to manually adjust the color balance in your image. On top of producing unrivaled color, the Phaser 6280 proves to have superior durability. With a monthly duty cycle of 70,000 prints, this machine was built to last. Continuing to use this printer over time will save your business a considerable amount of money. Users can save paper with the ability to skip blank pages, while saving time and money is simple with high-capacity toner cartridges that last for a long time—reducing the need for constant intervention. In addition, this printer is fully Energy Star qualified, giving you the peace of mind that you are reducing electricity use in your office, keeping utility bills low.